The True Flight's wide spear point holds up well to the extreme stresses of poorly executed throws. The knife's 5mm thick high carbon spring steel has enough temper to flex at impact without snapping or bending. Made of 1055 steel, which Cold Steel also uses in sword blades, the 9.7-ounce True Flight is ground with a single plain cutting edge and sharpened with a tough wedge bevel. Refine that edge a bit with a whetstone, and you'll have a usable camp knife. If you have no experience at throwing, you might prefer to start with a cheap set of knives you don't mind abusing, and when you begin to stick the target regularly, consider moving up to something real like the True Flight. This throwing knife has the weight to do serious damage by ricochets as well as intentional hits. Some fundamental skills in throwing will be a great safety measure. Paracord wrapping on the tang is the knife's only grip, so if you use it for much campwork, there will be blisters on your hand. If all you need is a dependable occasional-use knife, this is good enough. At 12 inches in overall length, it's certainly no ultra-light, but it's a very simple, rugged design that's tough to break. 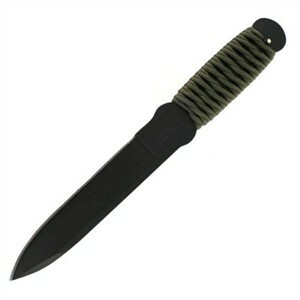 The knife comes with a lightweight belt sheath of Cordura fabric. For a competition quality throwing knife, see the Boker Ziel.